3D! Just got rid of my 3D tv... does anyone bother with 3D anymore? So just because you got rid of your 3D TV, you assume everyone else did the same? Why even come into this thread if you're not into 3D??? Never seen it. I do own it on Wuaki and the recent 4K edition, but not one …Never seen it. I do own it on Wuaki and the recent 4K edition, but not one I've got round to. Heard it's awesome, though. Everything in the movie is. Predictable, boring, stupid response posts = "DVD!? Do people still buy them? I can't watch that low resolution rubbish. A physical disc? WHY????" Predictable, boring, stupid response posts = "BLU-RAY!? Do people still buy them? I can't watch that low resolution rubbish. A physical disc? WHY????" Predictable, boring, stupid response posts = "BLU-RAY!? Do people still buy them? Who seriously watches 3D?? Not wearing glasses and I can't watch that low resolution rubbish. A physical disc? WHY????" Predictable, boring, stupid response posts = "DISCS!? A physical disc? Do people still buy them? WHY???? I only buy digital". Do you like The Lego Movie by any chance? Never seen it. I do own it on Wuaki and the recent 4K edition, but not one I've got round to. Heard it's awesome, though. looks like it could be 3D disc only maybe. they often did these as promo giveaways with 3D blu-ray players/TVs. I've had Kung Fu Panda £D like that before and the disc had no option of 2D. Whatever happened to your doppelgänger yesterday? This is valid point. I have a (top of the range at the time) 3D TV and have a large collection of 3D Blu Rays I enjoy watching. However, eventually I will suppose I'll have to replace it with an OLED oe whatever new technology is out . Its very unlikely that 3D will exist... hardly any new TVs have it. Its a shame but without support how we will we watch 3D in yeats to come once our old TVs have died? This is valid point. I have a (top of the range at the time) 3D TV and …This is valid point. I have a (top of the range at the time) 3D TV and have a large collection of 3D Blu Rays I enjoy watching. However, eventually I will suppose I'll have to replace it with an OLED oe whatever new technology is out . Its very unlikely that 3D will exist... hardly any new TVs have it. Its a shame but without support how we will we watch 3D in yeats to come once our old TVs have died? I guess another reason to buy an LG oled if you like 3d ... They still support 3d and are amazing oled displays. Never tried 3d myself. Yes me too, will have to get this, thanks OP. We have a projector, think that is the way to go. Shame they don't make 3D tvs any more though. I guess another reason to buy an LG oled if you like 3d ... They still …I guess another reason to buy an LG oled if you like 3d ... They still support 3d and are amazing oled displays. Never tried 3d myself. This years LG OLED sets have removed 3D functionality. Same goes for the Panasonic, Sony and Loewe OLEDs. Best bet is to buy a 2016 LG OLED if you can still find one. Richer Sounds still had a few remaining. 3D is a totally different beast when you get a projector - awesome, thanks! This years LG OLED sets have removed 3D functionality. Same goes for the …This years LG OLED sets have removed 3D functionality. Same goes for the Panasonic, Sony and Loewe OLEDs.Best bet is to buy a 2016 LG OLED if you can still find one. Richer Sounds still had a few remaining. :0 nice.. I hope amazon price match I’m too lazy to open an account! Thanks OP. Ordered - DELIVERY IS FREE - and didn't have to create an account as used PayPal. A projector pal if you can fit one in your house...best way to watch 3D and it's seems like it's still getting supported on the newer one's at the moment. Very true. It's very strange as 3D films are still heavily supported during the initial film making and upon cinema release. All major action films at least are released in 3d. My local cinema normally shows such films in 3d first. (imax and 4dx.... Newish editions). I am personally a fan of 3D and VR. Yes I don't play and watch it every week, but for me it's a nice treat and both are fantastic. I have the ks9000 and love it for the 4k hdr.... But it annoys me now that there is no 3d function. I dream that my next TV will show 4k 3D without glasses. (hey even has amberlighting) that would be perfect and incredible for me. Ordered, not really used the 3d function on my Panasonic much but I did enjoy life of pi so will give this a go. Plus I think these discs might start becoming valuable again as manufacturers stop making 3d hardware. I wouldn't bin any 3d bluray players and tvs at the moment, chuck them in the spare bedroom. I purchased this from 365games when they were selling it as a third party on the GAME website. They sent an edition that was either promo or import stock, not the UK retail release. I returned it, although that was twice the price of this offer... £2.99 is pretty good regardless! It was active 3d that ruined things. Nobody wanted to pay £100+ for glasses that you have to charge up and are heavy to wear. I bought the LG passive system and it has been brilliant. Same as used in cinemas so can't be bad. Panasonic and sony being too clever has spoilt it for everyone. It was active 3d that ruined things. Nobody wanted to pay £100+ for …It was active 3d that ruined things. Nobody wanted to pay £100+ for glasses that you have to charge up and are heavy to wear. I bought the LG passive system and it has been brilliant. Same as used in cinemas so can't be bad. Panasonic and sony being too clever has spoilt it for everyone. 3D comes into fashion in 30 year cycles - early 50s, early 80s and early 10s - then disappears. But whenever it happens it'll probably be the passive system or even glasses-free. James Cameron says he wants his Avatar sequels to be shown in glasses-free 3D. 3D comes into fashion in 30 year cycles - early 50s, early 80s and early …3D comes into fashion in 30 year cycles - early 50s, early 80s and early 10s - then disappears. So in 2043 it'll be back But whenever it happens it'll probably be the passive system or even glasses-free. James Cameron says he wants his Avatar sequels to be shown in glasses-free 3D. Yeah, glasses-free will be next but the tech is still a way off and viewing angles are poor. However, logically, by then all TVs will be screens that can each vary in size depending on what you want and with 3D as standard. Yeah, glasses-free will be next but the tech is still a way off and …Yeah, glasses-free will be next but the tech is still a way off and viewing angles are poor. However, logically, by then all TVs will be screens that can each vary in size depending on what you want and with 3D as standard. Toshiba released a glasses free 3d TV a few years back. But it was a bit crap like all 1080 sets. The 2016 LG sets are fantastic with 3d. Watched the Martian on mine, was amazing. Quite fancy Jurassic park (original) in 3d, supposed to be pretty good. If 3d was released now instead of on mediocre 1080 sets it would have taken off. Itll be back, manufacturers running out of ideas to push sets now. Whoops ordered and didn't read it properly didn't realise it was 3d only. Got the blu ray already - happy to spend an extra £3 for the 3D version! Thank you! 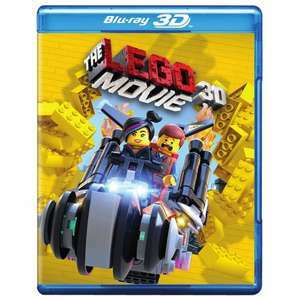 You have the 2d version of LEGO movie and you get the 3d version by stepping outside? how does this work?